Last Saturday morning we dragged ourselves out of bed along with the kids and into the car at 2.30am. This time is normally reserved for night-feeds (with which I’m all too familiar) and journeys to the Airport to catch a flight (that hasn’t happened in years). However on that morning we were joining thousands of other walkers and runners at the Phoenix Park in Dublin to walk 5km from darkness into light in order to raise funds and awareness for Pieta House. In fact the 5km wasn’t restricted to just Dublin and there were other locations all across Ireland where people came together to mark the occasion. The cause that Pieta House campaigns and works on is close to my heart. They provide free of charge support and a treatment programme for those who have suicidal tendencies or who are self harming. 80% of their income comes from fundraising and events. It’s a shocking statistic that more people died by suicide last year in Ireland than there were road deaths. Suicide, self harming and adult depression are topics that aren’t talked about enough nowadays. We chose to bring all our children with us to show them from a young age that it is always darkest before the dawn. That there is always hope and that the light will always come. Perhaps some people might not agree with us dragging our children out of bed that early in the morning but if we teach them early how there is always help no matter how bad things may seem, maybe one day they can help another or even help themselves. The baby slept through the night and into the morning, rocked to sleep gently by the motion of the buggy lulling him as I walked. Fat chance he’d do that on a normal night! The toddler thought it was a great adventure at the start, got cold in the buggy we had dragged out in case he got tired, and ended up most of the walk on his Daddy’s shoulders’ (he got a great work out that morning). Then the tweenager talked incessantly, clearing a path ahead and behind of the group. I kept with my pal Tracey while pushing the buggy and we chatted. It was an emotional walk. Plenty of yellow t-shirts were left behind on benches, looking over the park for those who couldn’t be there. The flame was carried at the end of the walk and brought home to great cheers. Families and friends stood shoulder to shoulder to mourn, celebrate, bring hope and raise funds for this amazing service. I had known beforehand that there was a nice group from our local area going on the walk along with a couple of other friends so Friday afternoon I knocked a few of my Marshmallow Crispy treats together and coated them with some dark chocolate for the adults. I then made a few breakfast muffins. The problem was that it was so cold, yet clear, on Saturday morning that they partially froze in the tins under the buggy while walking to the starting point at the Papal Cross. So by the time I handed them around they were a cross between a frozen banana cake and a hockey puck. They tasted nice though! On consideration I had added too much baking powder to the mixture anyway so I just had to rebake them today using my mixed frozen berries instead. This recipe is so easy because even though it involves baking there is no electric mixing, beating, sieving or loads of equipment. You only need a jug, a wooden spoon, a large bowl and a decent weighing scales. In fact you could measure out the ingredients and leave it to your children to bake them up for you providing you supervise the oven part. They are a lovely treat for breakfast on a weekend morning, fit well in a lunchbox and keep for about 4 days in a dry, sealed container. The recipe makes 12 breakfast muffins precisely which I like too! Preheat your oven to 170 degrees Celcius. Line your muffin tray with the 12 cases. Place your bowl on top of the scales and weigh all the dry ingredients (flour, sugar, baking powder & salt) directly into the bowl. Replace the bowl with the scales and weigh out the oil and the milk into the jug. Add the egg to the jug and mix well with your spoon. Pour the wet mixture into the dry mixture and mix well with the spoon until you have a batter with no lumps. You can use an electric mixer for this if you like, just this is quicker than taking equipment out! Once your batter is made pour in your berries, making sure each is coated with the batter. Spoon into each muffin case sharing the mixture equally between each. Sprinkle the top with a light dusting of brown sugar (light brown) and some flaked oats. Bake in the oven for 35 mins or until golden on top. 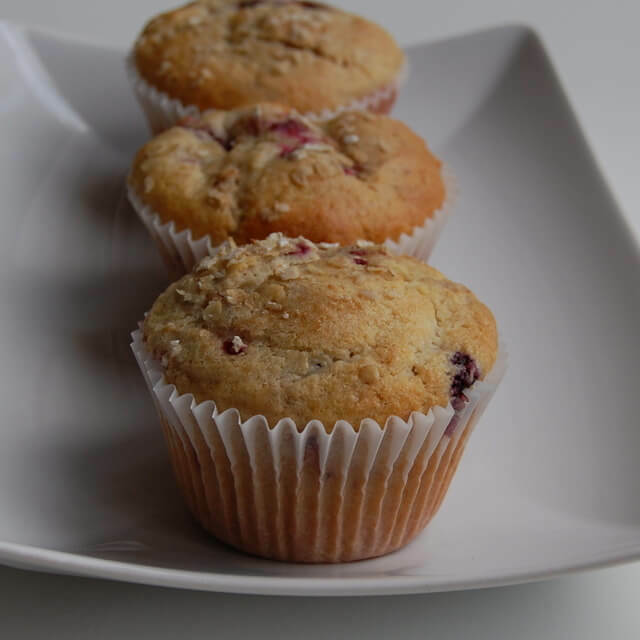 Leave to cool a little before serving as the berries will stay hotter than the muffin and you could burn your mouth. do you defrost the fruit or can you use from frozen to save even more time? Straight from frozen. No point in waiting for them to defrost if you’re going to cook them anyway. Charities like Pieta House need all the support they can get. Thanks Colette the muffins are so easy to make and stay lovely and moist. I always love your posts, but that one actually brought a lump to my throat. Your pictures are amazing too… I love the idea of telling children that the darkest hour is just before dawn, its something I often have to try to remember myself. Your breakfast muffins have become a firm favourite in our house, my 9 yr old daughter makes them with blueberries and has a batch in the freezer so she can bring one to school every day. Carriek that’s brilliant to hear. If you’re stuck for a quick breakfast they defrost very quickly in the microwave on high for 45 seconds, then leave to stand for 2 mins. It’s also my guilty dessert trick to microwave straight from the freezer & add a dollop of vanilla ice cream!